All digital transformation starts and stops with the empowerment of every citizen and organisation of a country, and India is no different, according to Satya Nadella, the 49-year-old, India-born chief executive officer of Microsoft, one of the world’s largest technology companies. “While we can celebrate technology, without this (empowerment) we would have achieved nothing,” said Nadella, who took over the reins of Microsoft from his predecessor Steve Ballmer in February 2014. 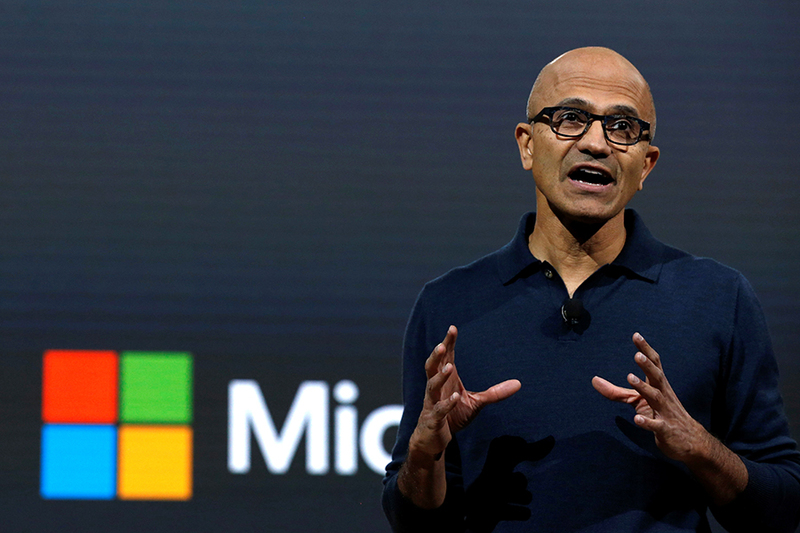 The Microsoft chief was in Mumbai on Wednesday to attend ‘Future Decoded’ – the company’s annual flagship technology and business conference in India. Nadella, who was the executive vice president of Microsoft’s cloud and enterprise business before taking over as the company’s CEO, is betting big on the adoption of new-age digital services in India, including cloud computing, Artificial Intelligence, big data and analytics, the use of bots and machine learning. These technology-based productivity, communication and coordination tools were now available in India in a “democratic way”, Nadella said. “These are now available to the smallest of businesses, and not just the large enterprises, at a fraction of the cost,” he added. The son of a civil servant, who originally hails from Hyderabad, said that Microsoft had made significant investments in India 17 months ago to develop a global, trusted and hybrid cloud computing infrastructure, which was enabling entrepreneurship and allowing small and large enterprises expand their businesses through cost-effective innovation. According to Nadella, the proliferation of IndiaStack was the most innovative thing happening in the country, and was also influential in shaping Microsoft’s future innovation agenda for India. IndiaStack is a set of application program interfaces that allows governments, business, startups and developers to utilise a digital infrastructure, powered by Aadhaar, to facilitate presence-less, paperless and cashless service delivery. The technology company, headquartered in Redmond, US, founded by Bill Gates and Paul Allen in 1975, appears to have figured out that since the opportunities and challenges in a digitally evolving Indian economy are unique, they merit unique solutions as well. Also, Microsoft, which was once best known for its Windows operating system and Outlook email service, is attempting to evolve as a complete digital services provider empowering businesses and individuals. A combination of the two factors has led Microsoft, under Nadella’s leadership, to design a number of tailor-made digital solutions for India. Among these new initiatives is a new product called Kaizala, aimed at easing India’s governance challenges through technology. “There are 300 million government employees in India who need information tools. They are currently using consumer internet services to get work done, and in the process, are giving away the data asset that is the government’s,” Nadella said. Kaizala is being positioned as a mobile app with a messaging interface that can help governments manage logistics, and coordinate the facilitation of essential services like health care and security for its citizens. The service, which is in a preview mode at present, has been piloted extensively in Andhra Pradesh, as well as during the ongoing Uttar Pradesh elections, in the functioning of the Niti Aayog and at several financial institutions and FMCG companies, Nadella said. The second strategy is to launch lighter versions of its marquee applications to give users in pockets where connectivity is unstable access to its services. Consequently, Nadella also announced the launch of Skype Lite and highlighted existing services like LinkedIn Lite. Skype Lite is a light-sized version of Microsoft’s messaging service that allows users to also make voice and video calls; while LinkedIn Lite is the similar version of the business and employment-oriented social networking service that Microsoft acquired in December 2016. The new Skype app that Microsoft is launching will also enable access to Aadhaar identification that will allow users to verify the identity of the person they are communicating with, a feature that is expected to be helpful during activities such as job interviews. New features have also been added to LinkedIn such as Placement – a tool to help college graduates land jobs basis their merit, rather than the reputation of their alma mater, and Starter – which is aimed to help fledgling businesses build their brands, and hire and retain employees. Microsoft is also bullish about the prospects of Project Sangam, an India-specific service that will allow for potential job seekers to get vocationally trained through the online education platform. The cloud-based service has been integrated with LinkedIn to help the users of Project Sangam to look for and get relevant jobs. While these new products and services are aimed at growing the user base for Microsoft’s products and services in the country, the company is continuing to focus on its large enterprise clients as well. On February 16, Microsoft signed an agreement with Tata Motors to help the carmaker enhance in-car connectivity and efficiency through its Artificial Intelligence, machine learning and Internet of Things capabilities. “A car can now collect and process more data and Artificial Intelligence than any computer,” Nadella said, and added that for auto companies, which are considered manufacturing enterprises, future profit margin growth is likely to come from the services it offers to its customers and not just the products it sells.